Authors may submit manuscripts for publication through any member of the editorial committee but should also send a copy of their manuscript to the Secretariat of the journal. Manuscripts must be submitted in electronically form in pdf and Latex (and any other form of tex) format. Authors are advised to keep a copy of their manuscript since the publisher cannot accept responsibility for lost copies. A not too condensed style is recommended. Manuscripts should be typed or printed with sufficient spacing (at least double spaced) with generous margins. Only one side of the paper is to be used, and the pages should be numbered consecutively (not by section or paragraph). Symbols resembling each other should be distinguished by suitable marks. Care should be taken to distinguish between 'belong to' and 'epsilon', 'Oh' and 'zero', 'one' and 'el' etc. References should be listed alphabetically at the end of the paper, numbered consecutively without square brackets, whereas references in the text should be indicated by numbers in square brackets. 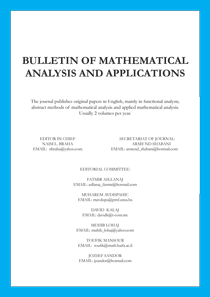 Authors should consult Mathematical Reviews for standard abbreviations of journal names. Manuscripts received are assumed to be final. If excessive changes are requested after an article has been typeset, the author will be charged with the cost of the alterations other than the printer's errors. The file should be in LaTeX (or TeX). Figures should be submitted separately as encapsulated postscript (.eps) files.